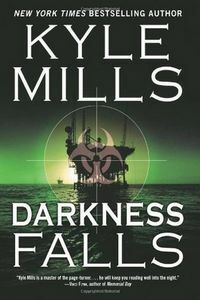 Darkness Falls by Kyle Mills, a Mysterious Review. Inexplicably, Mills takes this promising story and populates it with characters that are such extreme caricatures it is hard to take any of them seriously. (Mark Beamon, the recurring character in this series, is relegated to a minor role here that's completely overshadowed by others.) Erin Neal is a brilliant scientist who has retreated to self-sufficient solitude in the desert after antagonizing virtually everyone of any importance with his opinions on the state of the world's energy supply and use; environmentalists, capitalists, scientists, politicians, and anyone else in his path (including the reader). Jenna Kalin, Erin's presumed dead but just in hiding ex-girlfriend, is a self-serving moderate ecoterrorist who has adapted an oil-consuming bacteria to work in the oxygen-deprived depths of ANWR in Alaska. She doesn't care if the rest of the world destroys their own landscape as long as they leave what she considers hers untouched. Michael Teague is a radical ecoterrorist determined to destroy modern civilization in order to save the planet … as long as he can assure himself a comfortable spot in the new world order. And a whole cast of government officials who are portrayed as (typically) incompetent. Acknowledgment: Meryl L. Moss Media Relations provided an ARC of Darkness Falls for this review.